Bluefish is just about as polarizing a food as there is: You either love it or hate it. Pomatomus saltatrix is a pelagic fish that normally travels in big schools, eternally in search of food. They’re a lot like a pack of wolves, or oceanic piranha. All that travelling means bluefish have lots of red, slow-twitch muscle, which in fish is very, very strong and unpleasant to eat. 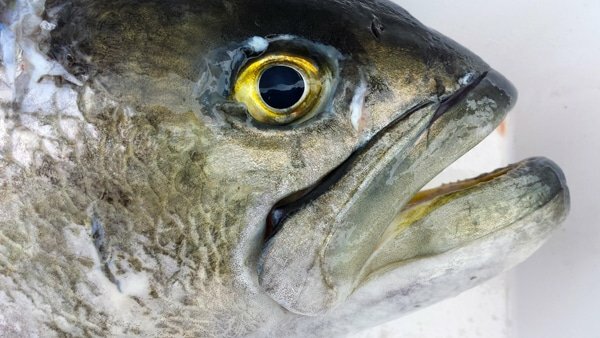 What’s more, the “white” meat, really bluish gray in a bluefish, is pretty soft. Oh yeah, and uncooked it doesn’t freeze worth a damn. So what’s to love? Well, cooked fresh, bluefish is fantastic — if you cook it right. I prefer mine grilled, slow barbecued or better yet, smoked. Once it’s cooked, you can then vacuum seal and freeze the white meat portions for eating later. In general, bluefish likes acid: citrus, vinegar, tomatoes, that sort of thing. It cuts the oiliness. 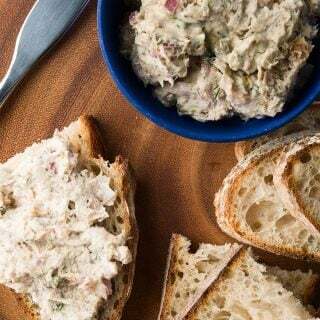 Smoked bluefish pate may well be the best thing you can do with blues, especially big blues larger than 10 pounds (they can grow to 25 pounds). Basically its fish, cream cheese, capers, lemon, onion and dill. Super simple, so good on crackers for a summertime lunch or appetizer. I’d been wanting to make it for a while, and I got my chance when I returned to Long Island — my old stomping grounds — to do some fishing with my friend, Chef Anita Lo. We fished out of Montauk, ostensibly for black seabass and gigantic porgies, which we laid into something fierce. All the while, though, I was hoping to get into some bluefish. Why? I can catch fish that taste like seabass and porgies here in California, but we have nothing like bluefish in the North Pacific. About halfway through the trip, Anita hooked a big fish on a porgy rig. It wasn’t coming up, either, and lest you think it’s because Anita is just a fancypants, big city chef, I can assure you that she is a real-deal angler; we’ve fished together in Alaska and she proved herself then. About five minutes into the fight, we all reeled up to watch the show. Tuna? Tilefish? World record seabass? Shark? Shark. Had to be a shark. Finally, about 15 minutes in, we saw the fish. It was a bluefish. A big one. And it was hooked in the gill plate, so it could swim freely. No wonder Anita was having a tough time! nearly 20 minutes in we gaffed the fish and brought it aboard. Easily 15 pounds, maybe more than that. 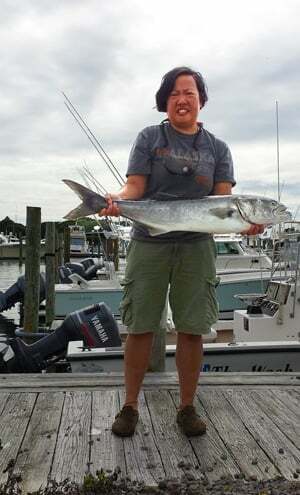 It was the only bluefish we caught that day, but it was enough. Anita can catch blues whenever she wants, so she was nice enough to give me this fish, which we filleted and I brought home on the airplane. I smoked it the next day, and it was awesome! Tasted like the old days. If you want to smoke your own bluefish, here’s how I did it: I had about 3 1/2 pounds of skin-on fillets. I mixed 1/2 pound of kosher salt with 1/2 pound brown sugar and packed the fish with it. I put that in the fridge for 4 hours, then I rinse off the cure and patted the bluefish dry. I let the fish dry uncovered in the refrigerator overnight. 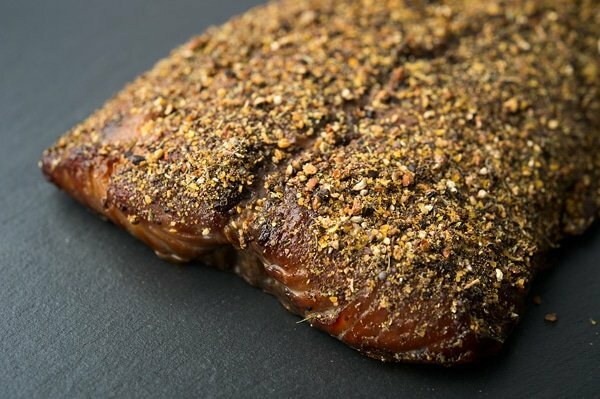 The next day I smoked it over alder for 4 hours, never letting the temperature top 200°F. When it came off the smoker, I painted the bluefish with some maple syrup and then sprinkled on a spice mix of cracked black pepper, crushed juniper, mustard seed, celery seed and thyme. After we ate a bunch fresh, I pulled off the skin and fishy red meat and vacuum sealed the rest to freeze for later. So good! 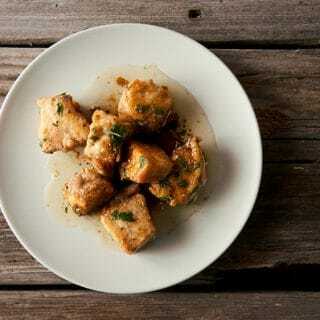 This recipe assumes you have cooked bluefish, preferably smoked bluefish. 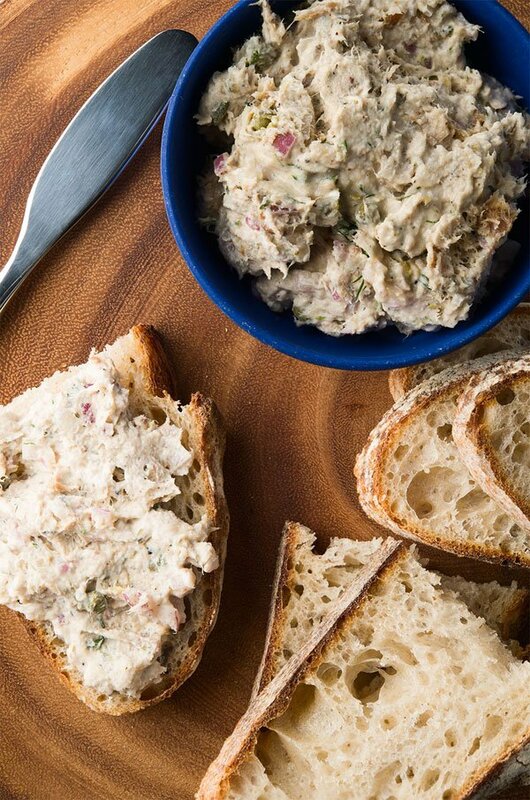 You can find smoked bluefish in most Northeastern markets. Or you can make your own. Or you can just cook up some bluefish -- on the grill is best -- and then use the cooked, flaked meat. No bluefish near you? Try these fish as substitutes: Mackerel (of any kind), shad, herring, sardines, freshwater sheepshead (drum), whitefish, cisco, wahoo, dorado or jack. Basically you want a pretty oil fish that isn't salmon. Remove all the red meat from the bluefish and either discard or give it to your pet. It's very fishy and most people (including me) don't like it. 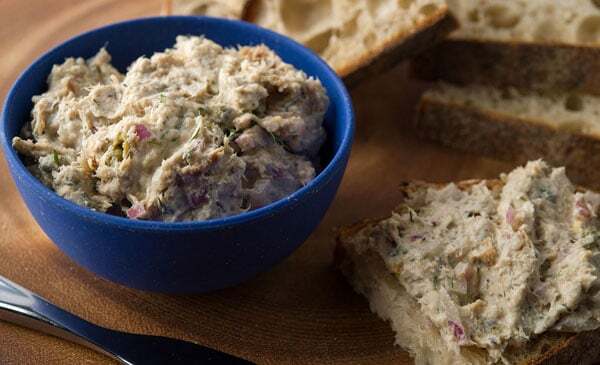 Toss all the ingredients in a large bowl and mash them together into a rough pate. If you want a smooth pate, double the cream cheese and mash everything up even more. Serve with crackers or flatbread. Once made, this pate will keep in the fridge for a week to 10 days. It doesn't freeze well, so my advice if you smoke your own bluefish is to seal it into 1/2 pound portions so you can make this whenever. You can find dozens and dozens of recipes for fish and shellfish here on Hunter Angler Gardener Cook! Hank, when you smoke the bluefish (skin on), have you scaled it? I’m guessing this is a dumb question, but I’m a rookie at smoking fish and don’t want to mess it up. Also, you don’t do anything to caramelize the maple syrup, just paint it on and eat? Thanks in advance, love the site! Max: Depends on my mood. Normally I don’t scale. Bluefish have large scales, and they protect that side of the meat when you are smoking it. Besides, you don’t eat the skin in this case, so you save some work by not scaling. Why not Salmon? I do pretty much this same recipe with cold smoked salmon and its pretty stellar. John: You could use salmon, but the flavors are pretty different. Ok. Just making sure I wasn’t missing something! I actually made it this weekend and my recipe is pretty much the same. I think the flavors, although different than bluefish, work really well with everything else in the recipe. Cheers! Glad I found your page!